National Medical Research Register (NMRR) – Why the need to register? In this issue we cover two separate studies on satisfaction levels. Results from the first article suggested that almost all patients were satisfied with the services provided in traditional and complementary medicine units in public hospitals. The second study which was on colorectal cancer screening found significant variation in the acceptance levels of different screening approaches. 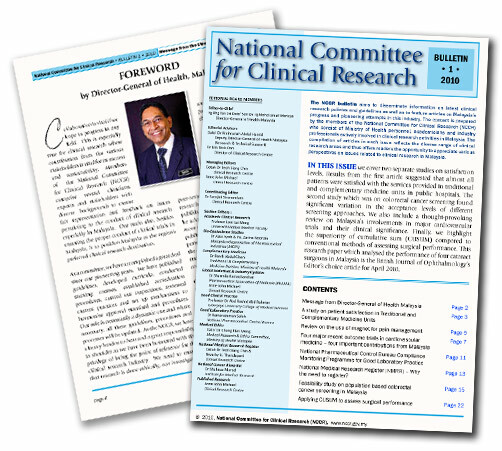 We also include a thought-provoking review on Malaysia’s involvements in major cardiovascular trials and their clinical significance. Finally, we highlight the superiority of cumulative sum (CUSUM) compared to conventional methods of assessing surgical performance. This research paper which analysed the performance of four cataract surgeons in Malaysia is the British Journal of Ophthalmology’s Editor’s choice article for April 2010.